Today was not a very good day. For a number of reasons (craziness at work, Steelers losing). The only thing that got me through the day was knowing I would be partaking in today's holiday. 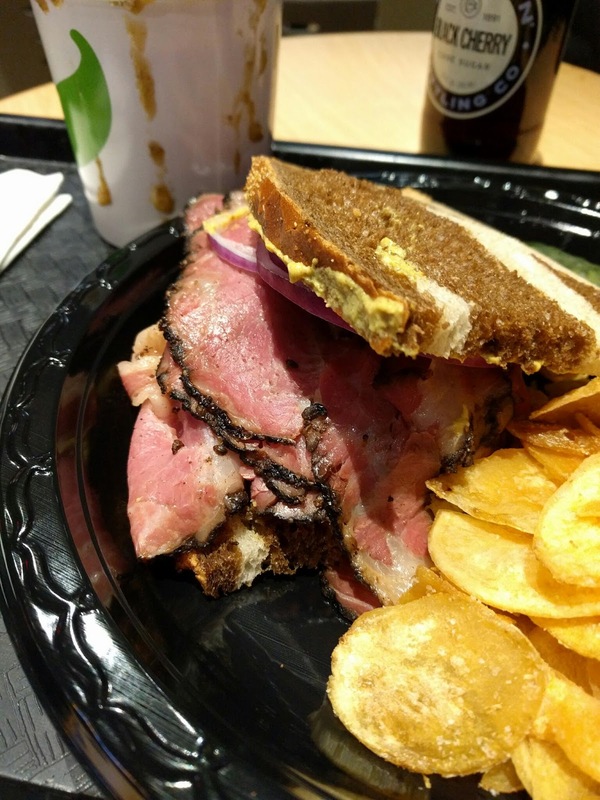 Best hot pastrami sandwich I ever had was in Baltimore. But then again, I ate a lot of good food when I was working down there. In New York? Eh... maybe Katz? Never really searched out for it. Couldn't find many places up here that serve hot pastrami sandwiches at 7pm on a Sunday. Ended up grabbing this one from Market Bistro in Latham. Marbled rye, mustard, sliced onion. Mushroom barley soup. Black cherry soda. I would have enjoyed this more if the bread didn't fall apart. Chips tasted fishy. Soup wasn't seasoned very well. Makes me wonder if I should try the other places in their food court. And do people eat in that restaurant? I saw a sign for prime rib on the weekends.